Looking for a job in Aroostook County Maine? The following is a directory of Aroostook County ME top employers with direct links to the jobs they offer. This directory includes local city job links as well as the larger job posting boards. Aroostook County's primary cities and towns for this review are Caribou and Presque Isle. Only sources that have job listing pages, business directories, and/or legitimate human resources contact listings are provided below. 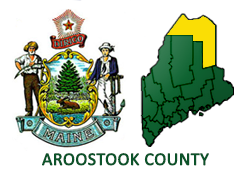 Aroostook County posts job opening on their home page when vacancies become available. During this review there had been a listing for a Full Time Custodian. Check for new listings. Caribou is a major city in Aroostook County that offers employment opportunities at various times throughout the year. During this survey open positions were found such as Children's Librarian, Ambulance Billing Office Manager, Firefighter Paramedic, and Reserve Officer. The City of Presque Isle's employment page provides current vacancy listings. Openings found had included Firefighters, Paramedics, and Seasonal Airport Maintenance-Equipment Operator. Central Aroostook Chamber of Commerce is a great resource to use for exploring area businesses. The Aroostook Medical Center TAMC is the leading provider of healthcare services in Northern Maine. A survey of open positions found included Billing Tech, Certified Medical Tech, Clinical Dietitian, Certified Nursing Assistant CNA, Certified Nursing Assistant Med/Surg, CNA Telemetry, Housekeeping Jobs, Paramedic Jobs, Certified Surgical Tech, Emergency Department CNA, Emergency Tech, EMT Paramedic, EMT Basic, EMT Advanced, Paramedic Careers, Environmental Specialist, Licensed Practical Nurse LPN, Graduate Nurse, Food Service Worker, Medical Assistant Jobs, Monitor Tech, Pediatric Physician, Pharmacist, Pharmacy Tech, Nursing Student Jobs, Respiratory Therapist, Radiologic Tech, Secretary, Receptionist Job, Registered Nurse Operating Room, OR Nurse, Registered Nurse RN Intermediate Care Unit, Telemetry Nursing, Med/Surg Tele Registered Nurse, Certified Medical Assistant, Ambulance EMT, Ambulance Paramedic, and more. Northern Maine Medical Center has ongoing employment opportunities. Among the positions that periodically become available are positions such as Physical Therapist, Maintenance Specialist / Housekeeping Attendant, Medical Assistant / Receptionist, Pharmacy Technician I, Outpatient Care Manager, X-Ray / Nuclear Medicine Tech, Sterilization Tech, Registered Nurse ICU, Med Surg RN, Occupational Therapist, Dietary Nutrition Aide, Phlebotomist, Switchboard Operator, Pharmacy Tech, Psychiatric Tech, CRNA, Psychiatrist, Hospitalist, ER Physician, and other positions. Houlton Regional Hospital's open positions available had included Acute Care Registered Nurse RN, Certified Nursing Assistant CNA, X-ray/CT Scan Technologist, Respiratory Care Practitioner, Sleep Tech, Per Diem CMA/LPN, Floor Care Housekeeper, Variable Shift Housekeeper, and more. Cary Medical Center is 65-bed acute care hospital in Caribou, Maine. The Cary family includes approximately 540 employees, 60 active medical staff providers, 100 courtesy and consulting physicians, and 75 volunteers. Openings found had included Acute Care Unit CNA Unit Secretary, Acute Care Unit Registered Nurse RN, New Nurse Graduate, Per Diem Nursing Jobs, Anesthesia CRNA, Case Management Jobs, RN Case Manager, Intensive Care Unit RN, Oncology RN Per Diem, Operating Room Nurse RN, Pharmacy Technician, Rehabilitation PT / PTA Per Diem, Ultrasonographer, and Imaging Receptionist. Madawaska School Department posts employment opportunities in the areas of Professional,	Educational Technicians, Co-Curricular, and Support Positions. Eastern Aroostook RSU 39 had postings for Teacher / Coordinator, CNA Instructor - Adult Education, English Language Arts Teacher Needed, Maine College Transitions Coordinator/Instructor, and more. Greater Houlton Christian Academy had been hiring for the position of Group Leader-Assistant to the Teacher. Check for current listings. RSU29 had a need for the following positions: Boys Basketball Coach, Two Full-Time Cafeteria Workers and Call-In Substitutes, Substitute Custodians, Substitute Bus Drivers, and Call-In Substitutes for Cafeteria. Easton School System was hiring School Bus Drivers. Check for updates. Maine School Of Science & Mathematics had employment listings for Residential Instructors, English long term substitute, and Summer Camp Employment Opportunities. School Union #122 had coaching positions available. Periodically the district hires for teaching positions, substitutes, bus drivers, cooks, and professional positions. Regional School Unit 50 is comprised of Katahdin Elementary School (PK-6), Katahdin Middle/ High School (7-12), and Southern Aroostook Community Schools (PK-12). Employment page was not found. Maine School Administrative District #1 had positions available for ESL Teacher and Sub Bus Drivers. MSAD #20 is a single town school administrative district serving 600 students in grades Pre-K to 12, with 102 full and part time employees. During review there was an open position for a Bus Driver / Custodian. MSAD 33 is a K-12 with an enrollment of 248 and approximately 55 employees. Click on their "Position Vacancies" for current listings. The MSAD 42 employment portal was not found on this review date. MSAD 45 had announcements such as Substitute teachers needed for Elementary and High Schools, Substitute Kitchen Staff, Junior High Cross Country Coach, and Substitute Bus Drivers. MSAD 70 periodically posts open positions in PD format. During this survey openings were found for Lego Robotics Instructor and School Guidance Counselor. Northern Maine Community College NMCC hires for faculty instructional teaching positions and support staff. University of Maine at Presque Isle and University of Maine at Fort Kent periodically post instructional and support staff positions when vacancies become available.